Our family has a subscription to Martha Stewart Living Magazine, and the two of us and our mom love it because it has beautiful things in it- gorgeous fashion tips, classy decor, and pictures with the most golden light you ever saw. They also make whipping up a fancy 3-course meal complete with a decorated tables look like it makes no mess whatsoever (lies. Just ask our mom, and she will tell you. And we’re somewhat tidy cooks too!). Many issues come with an Everyday Food insert that contains simpler recipes that are more practical for your typical summer meal, something that you don’t need cleaning staff in order to make. Well, these magazines have a tendency of stacking up after being paged through briefly and then put aside for when we have time to properly read them. That never seems to happen. So, we spent an afternoon a few days ago sorting for a few hours through the couple hundred magazines or so that we had in a giant pile by my desk that was starting to turn into an actual avalanche. I wish I was kidding, but every time I put something on top of the stack the whole pile would slowly slide down and collapse. It would have been a manageable task to sort through if we subscribed just to Living, but sadly, no (the school magazine drive basically requires every student to order 6 magazines each school year). It was full of Teen Vogue, Cook’s Illustrated, Cooking Light, and Bon Appetit as well. Side note: do you notice a pattern with our magazine subscriptions? Thankfully the horrible job is done now, and we found some great recipes! This sandwich was one of the great rediscovered recipes, even though it’s from the most recent issue and is therefore not a found artifact from ’09. Still, it’s a very good summer dinner, when all these vegetables are in season and grilling seems like a better idea than turning on the oven. These sandwiches are very healthy but do not lack flavor! The grilled tomatoes were especially good. We opted to add feta cheese to our sandwiches, which added a very nice touch. Try this out for a satisfying vegetarian meal this summer! P.S. Three things: 1) We forgot to hollow out the insides of the bread, making these sandwiches more challenging to eat. Don’t forget like us! 2)If you’re curious what muffaletta is, Wikipedia has your answer. 3) Next pile to tackle? College mail! Boy, will that one be fun! In a bowl, toss eggplant with 3/4 teaspoon salt. Let rest for 30 minutes. Meanwhile, in a food processor, pulse olives, pepperoncini, and parsley until very finely chopped. Transfer to a small bowl and stir in mayonnaise and garlic. Heat a grill to medium. Clean and lightly oil hot grill. Toss eggplant, tomatoes, and zucchini with olive oil and season with salt to taste. Grill, turning frequently, until tender and slightly charred, about 4 minutes for tomatoes and about 7 minutes each for eggplant and zucchini (just start with the eggplant and zucchini; then, after 3 minutes, put the tomatoes on and then the vegetables will all be done at the same time). Spread bread with olive mayonnaise. 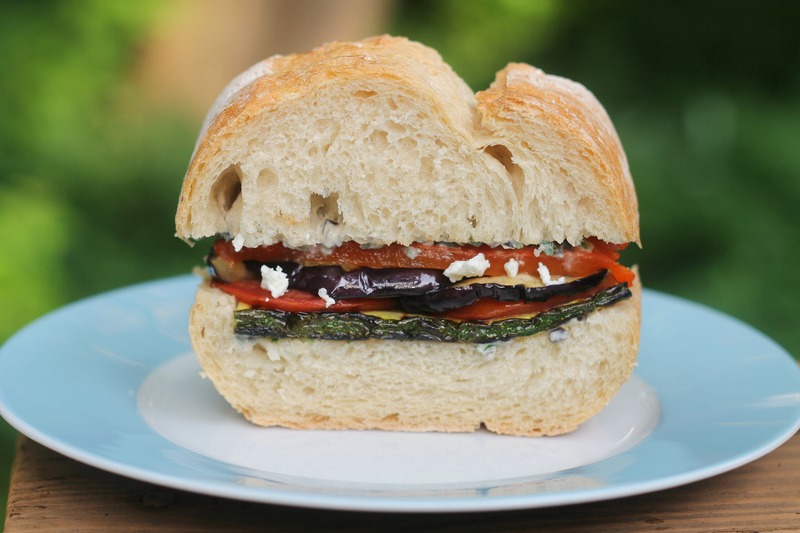 Assemble sandwich with peppers, eggplant, zucchini, and tomatoes. Serve immediately or wrap in plastic and refrigerate for up to 4 hours. Enjoy! Those look some delicious summer sandwiches! A great idea for a summer meal. I totally know what you mean about magazines piling up, I have quite the pile of Oprah , Chatelaine, and Cook’s Illustrated I need to go through myself! Thank you! They were a delicious and fairly easy meal. As much as I love magazines, they do really pile up! !